EDMONTON – The Alberta-British Columbia District of Lutheran Church–Canada (LCC) and the Roman Catholic Church’s Archdiocese of Edmonton are sponsoring a joint concert to commemorate the five-hundredth anniversary of the Reformation in 2017. 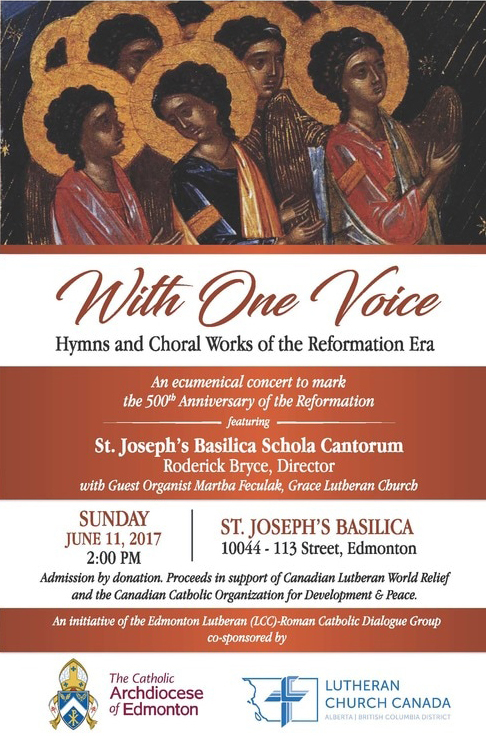 “With One Voice: Hymns and Choral Works of the Reformation Era” is scheduled for June 11, 2017 (2:00 p.m.) at St. Joseph’s Basilica in Edmonton. Admission is by donation, with proceeds going to support Canadian Lutheran World Relief and the Canadian Catholic Organization for Development and Peace. The joint concert is an initiative of the regional Edmonton Lutheran (LCC)-Roman Catholic Dialogue Group. It will feature music by St. Joseph’s Basilica Schola Cantorum, with Roderick Bryce as director. Martha Feculak of Grace Lutheran (Edmonton) will feature as guest organist.